How many of you feel that you don’t have enough time to prepare a healthy breakfast? Are you bored of having the same old cereal, bread toast and orange juice in the morning? Wish you could makeover your breakfast routine? Then the answer is green smoothies! I know what you are thinking. “Oh! green smoothies, that’s not my kind of thing. It’s not for normal people. I’m not such a raw food junkie”. I too was very hesitant at first but after trying a few recipes, I have really started liking the concept. To me the key is “taste”. As odd as it may sound to blend a few greens and fruits together to make a supposedly healthy concoction, once you like the taste, it doesn’t feel weird anymore. You will start wondering how come you missed such an amazing, interesting, tasty and easy way to consume greens all these days. Not only that you will start trying recipe after recipe and each time you will be surprised how good it is. But for all this to happen, you have to try it once. 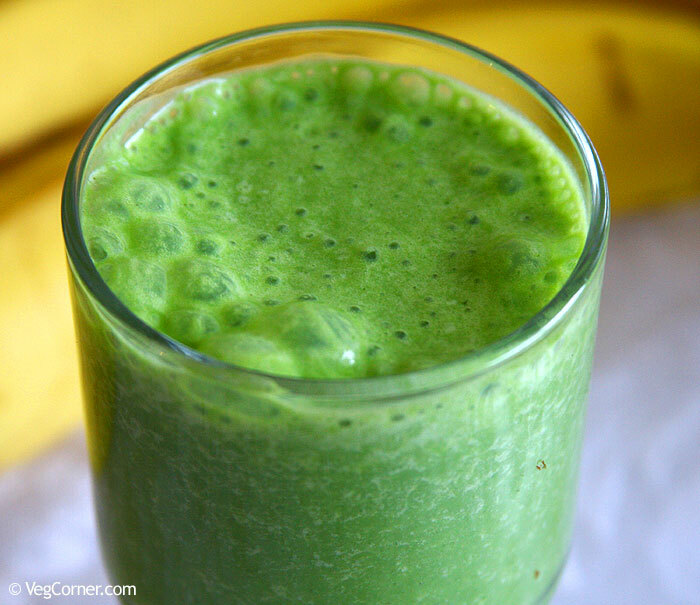 For someone like me who doesn’t jump to explore new tastes and ingredients pretty quickly, it took about a week or so to try this basic banana spinach smoothie recipe after I heard it from my Chiropractor. He is a fabulous guy, who goes over and beyond his professional role to educate his patients about nutrition and fitness. His green smoothie recipe was a blend of banana, romaine lettuce, rice milk, flax seed oil, and a liquid multi-vitamin. I had all the ingredients in the refrigerator on the very same day but I was very hesitant to give it a shot. The idea of blending lettuce with banana sounded crazy to me. Finally, I decided to give it a try one fine Sunday morning. I made it with half a banana, 2 leaves of romaine lettuce, flax seed oil and little almond milk. Used the regular Indian mixer to blend it. The smoothie was in light green color. I mustered some courage and took a small sip but trying to swallow it pretty quickly without tasting it, but wait, what is it? It didn’t taste bad at all. Then I slowly took another sip and this time I actually let the smoothie coat my taste buds and really liked it and was literally jumping in joy. I immediately made another batch and gave it to my husband and son. At first I said that it was avocado milkshake (the recipe to follow soon) to my son because I make it regularly and that too has a light green color and he loves it. Since I said that it was avocado milkshake he did not hesitate to drink it and was enjoying it as usual. I then asked him if he liked it and if he found it any different, for which he replied he loved it. So that’s when I told him it was lettuce milkshake and not avocado and he was as surprised as I was before. From then this smoothie has become a regular in our house. Later I tried it with baby spinach which too was liked by all three of us. So nowadays my son and I have the lettuce or spinach smoothie at least twice a week. The breakfast routine for my son is avocado milkshake and spinach/lettuce smoothie twice a week each, so four weekdays are covered. The other day is apple milkshake (with dates instead of sugar) or a vegetable medley (with mushrooms, paneer, and vegetables) and a glass of milk, or a bowl of fruit salad. On weekends he can eat whatever he wants including bread, cereal, pancakes etc. I also don’t get any fancy cereal for him and worry about the fiber content because he gets enough of those from his vegetables and fruits. So it’s the basic Cheerios and Rice Chex which has the least amount of sugar but tastes good too. When you get a chance do borrow the book Green Smoothie Revolution by Victoria Boutenko from your local library. She shares a wealth of information about eating raw greens and more than 100 green smoothie recipes. The one important thing to note is you will have to rotate the greens you are consuming. Don’t use the same greens every day because many plants have ingredients including alkaloids in them that could become slightly toxic if eaten in large quantities. Nature has done this in order to encourage animals to vary their diet so that the plant would not be eaten to extinction. I did try a few recipes from the book and liked it all. So I’m actually thinking of buying this book and my dream blender sometime soon. Blend together the sliced bananas, spinach and about 1/2 cup of milk to make it a smooth puree. There should not be any lumps. Now add the remaining milk and blend it once again. You can adjust the quantity of milk to get the desired consistency. Serve it immediately. I was as skeptical as you are now while reading this, or even more because when it comes to food I do not take any risks. I’m the kind of person who cannot eat or drink something just because it is healthy. It has to taste good. I might even compromise on the looks (for a little bit maybe) but definitely not the taste. So I prepared it in a very small quantity and gave it one big gulp as if trying to swallow some bitter medicine. I shouldn’t have worried that much after all because it was YUM! I was even more surprised that my son loved it too. I’m not kidding guys! My then 5-year-old son loved this green smoothie the very first time I made it and still loves it even after a year, which is so unusual of him because his favorites keep changing. I shared this recipe with my mother and she too tried it in India using the big palak (Spinach) leaves they get there and she too loved it and she passed on the recipe to her friends and they were super excited too after trying it. You have my word on this. So do try it as soon as possible and I assure you that you will not be disappointed at all and will be doing the happy dance! I first tried this recipe with lettuce and then with spinach. Both taste quite the same and the difference is only in the color. If you want a bright green smoothie use spinach otherwise use lettuce. I always use organic baby spinach from Costco. Organic produce is comparatively cheap to buy in Costco. 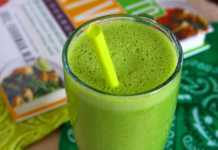 I have even tried this green smoothie with the organic spring mix which is used for salads and baby romaine lettuce. Since I’m able to get fresh organic baby spinach regularly, I haven’t tried this recipe with the big mature leaves. I have also used quite a variety of milk in this smoothie recipe. I have used rice milk, almond milk, and dairy milk. Sometimes I just soak about 10-15 almonds overnight. The following morning, before preparing the smoothie, I remove the skin and blend it together with the banana, spinach and plain water. This variation tastes good too but not as sweet as the one with the milk. Actually, I prefer this milk-less version. I have also tried this recipe adding mangoes and peaches. Depending upon the fruits’ taste you may get a slightly sour smoothie. While skeptical at first, I took a leap of faith and used your recipe. It is not only nutritional, but also delicious. Thank you. Thanks Nataly. Do rate the recipe when you find time. I am a vegetarian and I have been reading your recipes for some time now. I tried baking eggless strawberry banana muffins using your recipe which came out well. I have been extremely hesitant to try these soups and smoothies so far. However, my 2.5 year old daughter has been asking me for soups and I think I am going to try these soon. Where do you buy blueberries here in the US? Do you get organic? Frozen or fresh? I shall soon try your soups and smoothies and comment on them. Thank you! Thanks for taking the time to give your feedback, Ramya. Do try the soups and smoothies and I’m sure that you will like it. Regarding blueberries, I use organic, fresh and frozen, whichever is available. You get it in the usual grocery stores. My children also loved it! Thanks Manju. Do rate the recipe. I was really intrigued by the very title of the recipe and wanted to see what went into it! Read the whole recipe and the fact that you have already tried and tested it kind of gave me the courage to try it today. 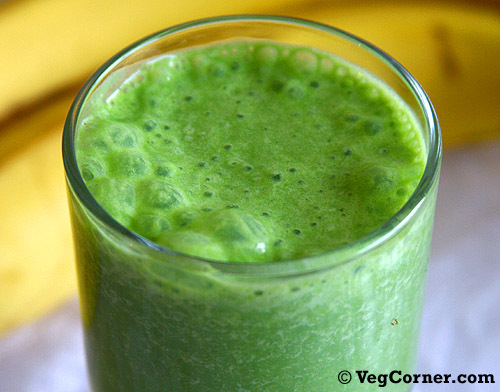 I tried the recipe with normal bagged spinach and I couldn’t believe that I could not taste the spinach as I had imagined!Seems like the banana masked the spinach and enhanced the overall taste and flavor of the smoothie. I liked it and I’m sure would be making again as it seems very healthy and nutritious. Thanks for the recipe. Also, I’m also making a veggie soup from your blog and I believe this is the 3rd recipe I’m trying from your blog in the last couple of days!! Thanks again for giving a wonderful recipe collection for vegetarians. You’re welcome Sumitra. Nowadays I use just half a banana and load it up with berries for a not too sweet smoothie. 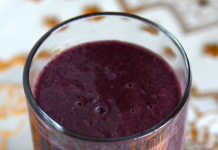 Berries and especially blueberries in particular are full of antioxidants and you need it everyday. Try that variation too. It will not be as sweet as the banana one but I prefer the sour taste to the too sweet banana smoothie. So good and so easy, now there is no excuse for having an unhealthy treat instead! I like these as much as those sugar loaded specialty Smoothies that run you $5 or more! A great way to utilize spinach too, more fun than a salad. More fun than a salad is the key. Thanks Madhuram I will look it up in my Library. But this is interesting that Greens are not vegetables!! I will definitely go through this book & give my feedback. Thanks & now I will try this green smoothie tomorrow & let you know. I always had this debate going on in my mind but did not have a channel to put it forth, I guess I could only ask the research specialist who could solve this issue ..
Is it okay to have fruits & Vegetables together…?? I have read & heard about this from various conventional sites & also from our parents that this is straight NO No.. 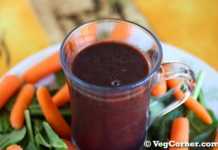 He says do it & all your toxins will be out & you automatically change your habits …Well I would like to give it a shot & if we have to do this, we might need variations like combining veges & fruits .. I would like to take your advice on this & go forward from there. Sandhya, thank you very much for taking time to write to me. I’m not even close to a research specialist though. I read the answer for the exact question in the book I have mentioned, Green Smoothie Revolution. Spinach is not a vegetable; it’s greens. So is lettuce, kale, chard, collard and the umpteen other types of greens. The book says that greens are not vegetables. Greens and fruits can go together. I don’t know where you live but if you are in the US/Canada or anywhere with a good library, you should definitely find this book and read it. All the recipes she has given uses only greens and fruits. She doesn’t mix vegetables and fruits. Even further she tells that not to mix seeds, nuts, oils, milk etc to the green smoothies because it weighs down the benefits. I have to slowly accomplish that too. I have been making this smoothie for a while now and everybody in my family loves it…even my 22 month old…can you believe that?….she won’t eat veggies and I am glad she gets at least some in the smoothie. What I love about smoothies is that they are filling and can be made with anything on hand. Please share apple milkshake recipe. It is quite filling Nimisha. My 6 year old loves it very much. I’m not sure whether I can give it to my 16 month old, because the spinach/lettuce is raw. I don’t know if their tender system can digest it uncooked. For the apple milkshake, I blend an apple with 2-3 soft dates and milk. This is a perfect detox recipe! It’s true that once you get your head around some unconventional flavour combinations, you start to almost crave the stuff! Love the vibrant green… a great way to wake up 🙂 Mighty curious about this apple and date milkshake, too! Do you have a recipe? Sounds delicious! I wonder if you could add nettle too? Wat a stunning and super healthy smoothie..